With a peculiar side step and a twisted nose, a large male polar bear makes its way along a snowy road near Churchill, Manitoba, Canada. An adolescent male polar bear, though not huge, is definitely a large and heavy animal. We saw the large polar bear walking along a side road towards a camp near Churchill in Manitoba, Canada. Polar bears, Churchill, Manitoba, Canada, Hudson Bay, Polar Bear, Ursus maritimus, in the Churchill Wildlife Management Area, Hudson Bay, Churchill, Manitoba, Canada. 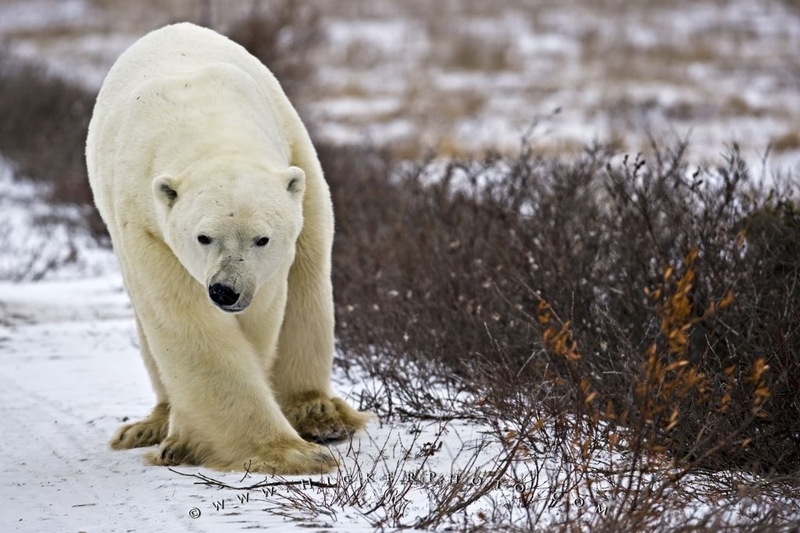 Picture of a large male polar bear near Churchill, Manitoba, Canada. Pictures from photo gallery "Manitoba Pictures"
This picture is part of the photo album "Manitoba Pictures" - there are more beautiful images waiting for you.